Living room is, without a doubt, the heart of your home, no matter if you live in a small apartment or a spacious house. This is where we spend our time once we return from work, where we relax watching a good movie, and where we meet with our loved ones during holidays and family celebrations. As we arrange this interior, we should make sure that not only is it functional - it also looks beautiful. 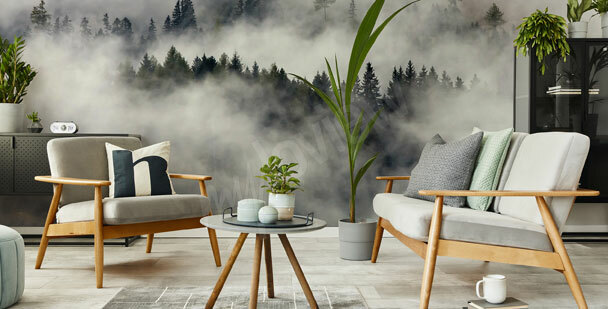 Among the vast selection of designs, we can find city panoramas, landscapes, abstract designs, as well as spacious murals for living room that will optically increase the size of our room. 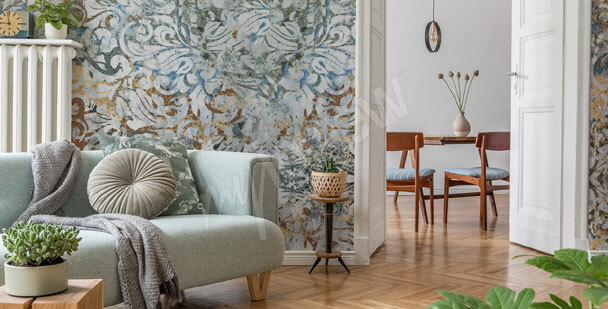 Let’s remember, that by choosing murals for living room with a universal design, we’re creating an interior full of timeless beauty and charm. 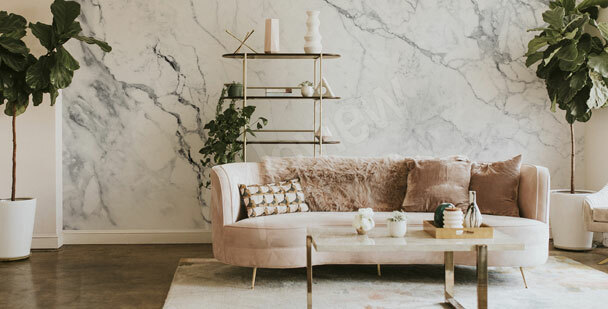 Trendy murals for living room can bore us very quickly - instead of following the example of others, we should trust our own sense of style. 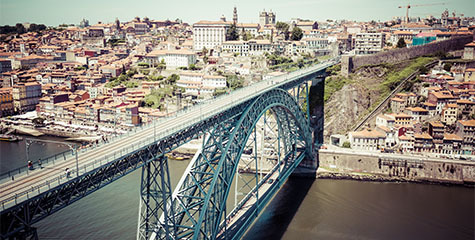 Despite its seeming simplicity, the design is full of hidden details. The black-and-white panoramic view will look wonderful in any interior. 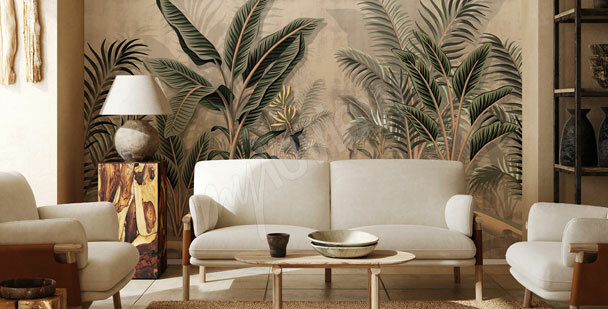 Wall mural with a natural landscape is an offer for a living room dominated by wooden elements and earth tones. Faux aged wood is a perfect design for any shabby chic interior. Your living room will become a place with a soul. All science-fiction fans will surely appreciate a whole galaxy in their living room. 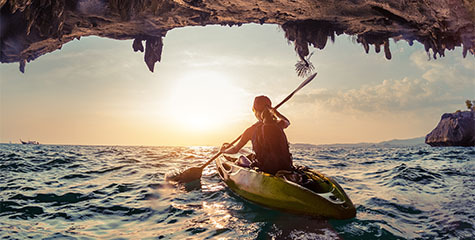 This cinematic motive will bring you more energy and facilitate relaxation. 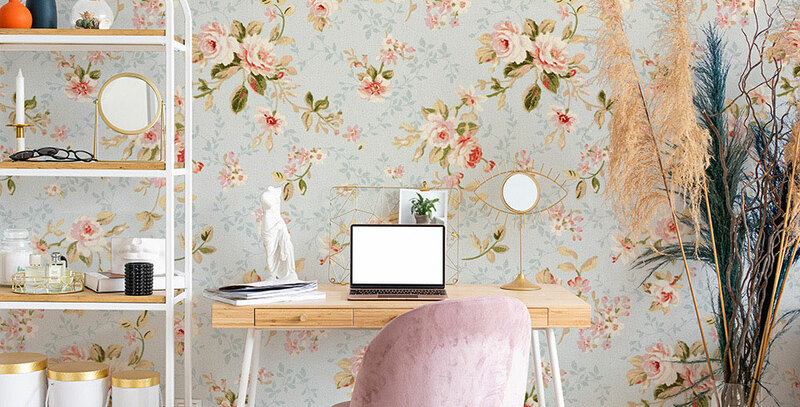 Floral motives can be used for more than just a feminine living room. The elegant black flowers will transform any type of interior. 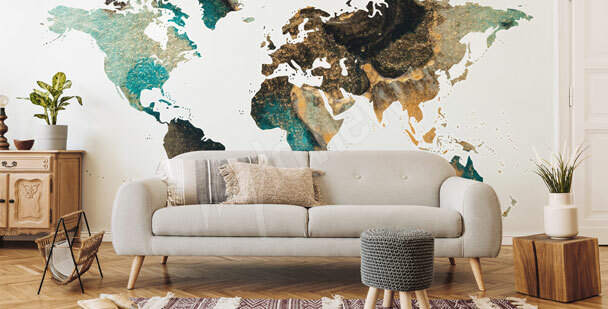 A map mural is a perfect addition to a traveler's living room, while the vintage style takes you back in time to feel the spirit of the past. 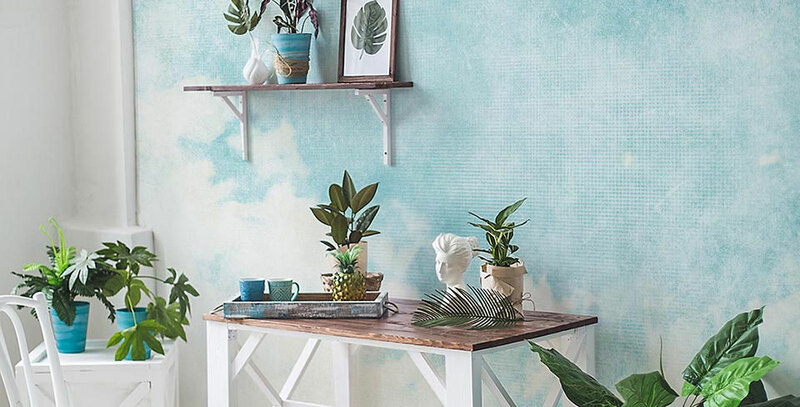 Invite nature to fill the walls of your living room! This green motive will bring a breath of fresh air to your interior! 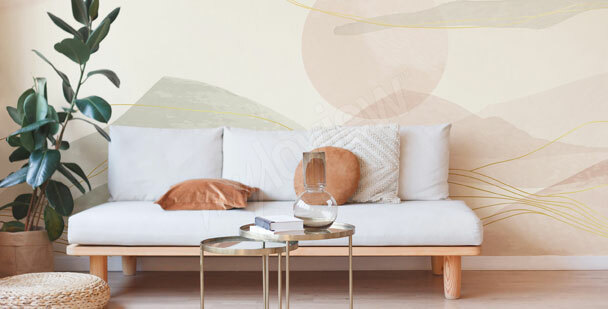 Sunset wall mural is a universal decoration for a living room. It should be applied to one of the walls. 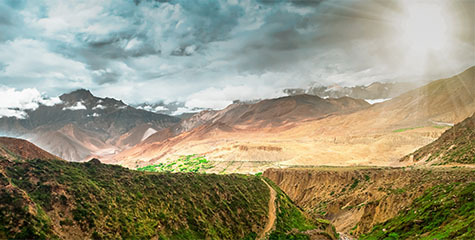 A mountain landscape will emphasize the living room décor kept in natural and eclectic style. 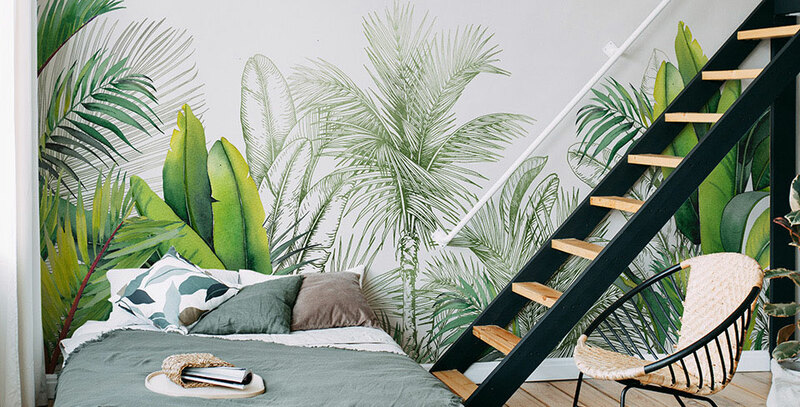 This mural is offered for spacious interiors. 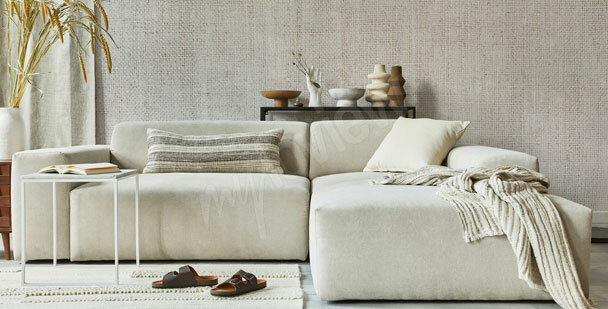 Transform your living room into a kingdom of tranquility. This peaceful, blue hue is the perfect choice for the job! Let a spark of positive energy into your living room! 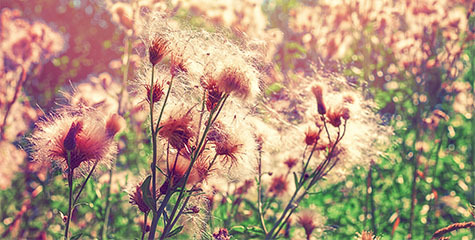 The happy colors of the flowers will boost your creativity and motivation. 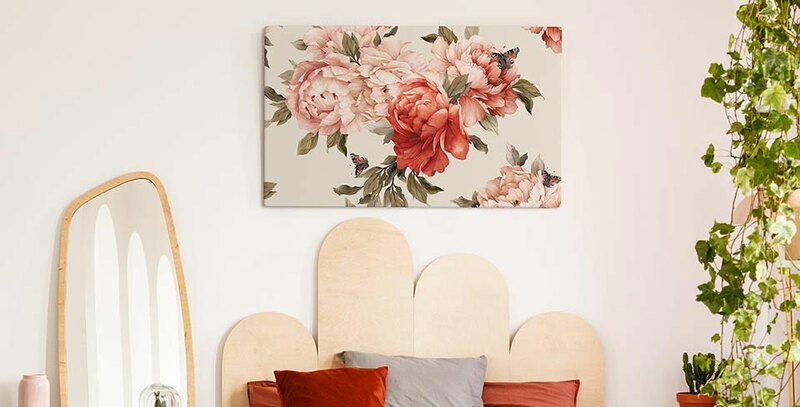 Browsing the internet for mural ideas for living room can give you a headache. 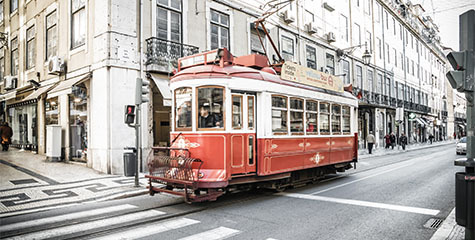 The amount of patterns and motifs is so huge that it’s easy to lose our track. To avoid that, it’s worth to follow two fundamental factors while choosing murals for living room: specifications of the room and our aesthetic preferences. STEP 1. TRUST YOURSELF. 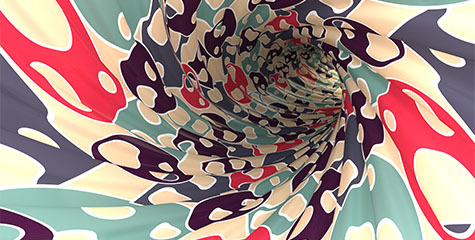 Trendy murals in living room may tempt us, but we must remember that fashion can change very fast. 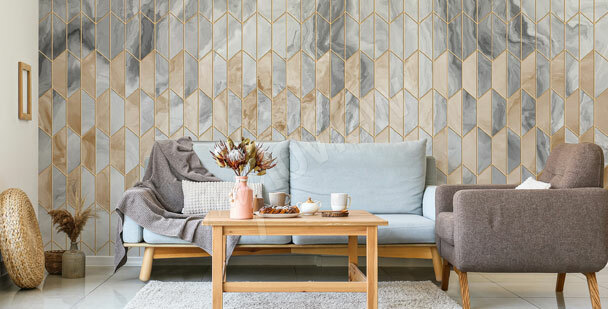 If we’re not fans of abstract or geometric designs, we shouldn’t buy such wall mural just because it’s recommended by all of the decorating magazines. 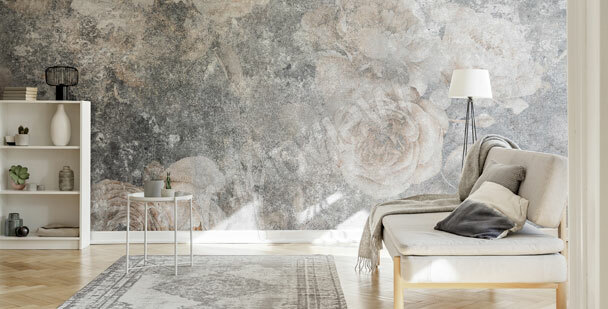 Trust your taste and choose murals for living room that you like, no matter what current trends may be. Only then will you be sure, that you’ve chosen a design that won’t bore you, and that will bring you joy with the same intensity as the day you’ve applied it! STEP 2. BE PRACTICAL. While choosing a given design of a mural in living room, we must remember to keep in mind it’s specifications - the size and the amount of daylight that enters our interior. Small interiors don’t like dark colors, as they can make your living room seem even smaller. In case of such interior, it’s worth to use mural ideas for living room in bright, glowing colors. A great choice are living room wall mural ideas with a 3d, spacial print that will make the room see much bigger. On the other hand, a dark room should be brighten up with murals in living room depicting a sun-soaked cityscapes, landscapes in energizing colors, or bright abstractions. 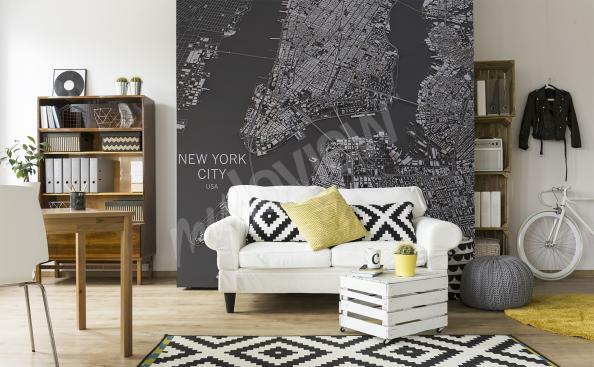 If you enjoy big city life, if urban skylines are that you like the most, and if you can’t imagine a night-sky without planes circulating under the stars, then living room murals with urban depictions are a great choice for you. Breath-taking views of New York, Paris or London will be a stylish and universal decoration of minimalist and industrial interiors. Additionally, living room mural ideas with images of bird’s eye panoramas will create the sense of depth - thanks to that even the smallest of living rooms will seem bigger than it actually is. If you have a spacious and well lit interior, murals for living room with an image of a city at night will be an interesting option. Dark sky and the shine of thousands of lights create a breathtaking composition that will energize a minimalist interior. 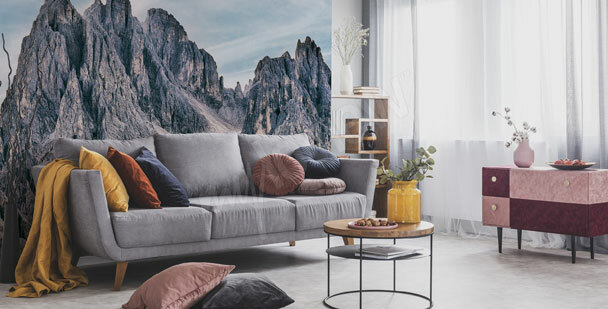 If you don’t like the loudness of cities, but are full of admiration for the beauty of nature, we’d like to offer you mural ideas for living room with images of landscapes, flowers and animals. This type of designs will fit nicely into a rustic living room filled with wooden furniture in natural colors, flower motifs and wickerwork. 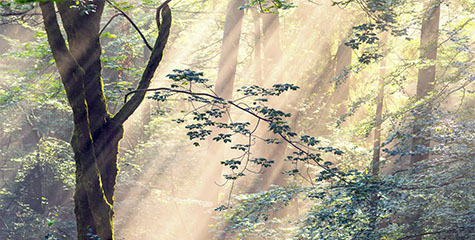 Mountains, meadows, waterfalls, sea and forests are just some of the designs from our store’s rich selection. 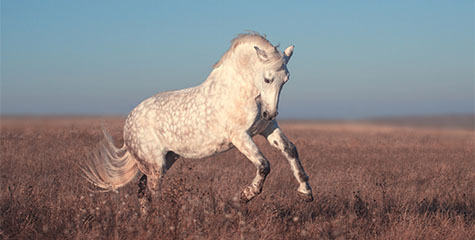 And if you adore animals, you will certainly like our murals in living room with a 3d image of majestic, galloping horses. If you’re looking for original and timeless inspirations, then mural ideas for living room with abstract or geometric designs will be a perfect choice. Cubist compositions, freely created spots of color, or shapes that create an optical illusion, are a great complement to a modern, minimalist interior. 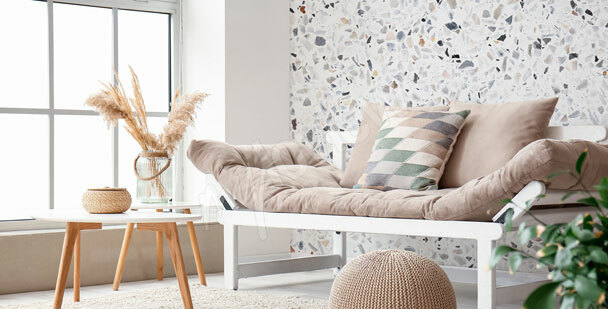 We also have living room wall mural ideas for smaller interiors. 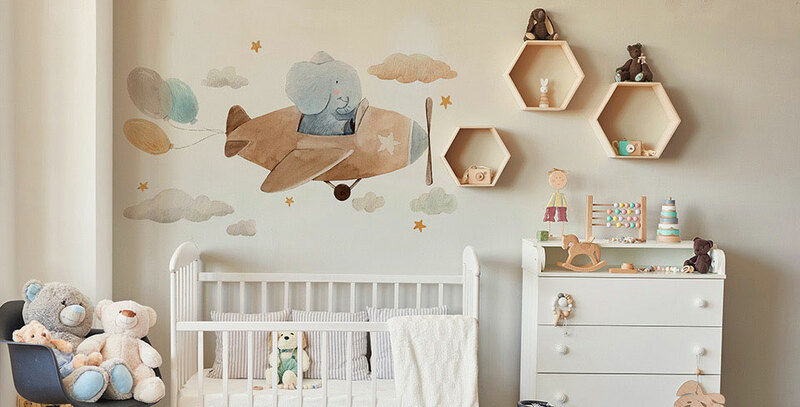 Small rooms can be easily enlarged by choosing a mural with a geometric 3d design, that will create a sense of depth and add more space to your interior.